I normally love her books but this is not Anita Shreve's best work. This is the intertwined stories of two women from different time periods who both go through traumatizing experiences. First is Jean, a photographer who is researching a double murder that took place in the 1870s on the Isle of Shoals. She finds a letter that was written by the only survivor, Marne Hontvandt. Through this letter we learn of the hard and tragic life of a Norwegian immigrant woman. As Jean becomes more involved she starts to believe that her husband is having an affair and she tries to come to terms with her life and problems. This book was lacking something. Maybe it was because of the fact the story bounces from modern day to the 1870s but I did not care about the characters. The book seemed somewhat rushed (it was only 246 pages) so the characters were not developed very well. 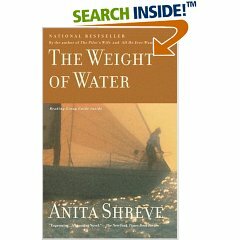 If you haven't read any of Shreve's work make sure you pick up The Pilot's Wife or Fortune's Rock before you choose this one. However, there was a film version of this book made in 2000 starring Sean Penn that I think would be interesting to see. Maybe it will be better as a movie.